The 18,300 TEU Munkebo Maersk alongside at DP World London Gateway on Thursday morning. London, UK, 26th February 2015:- The Munkebo Maersk became the largest ship to ever sail up the River Thames as it called at DP World London Gateway, the UK’s newest deep-sea port hub today. 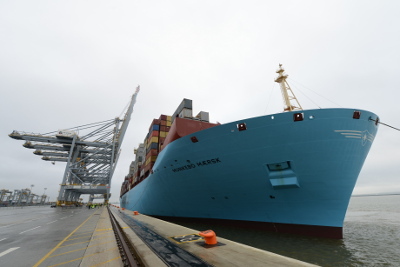 The 399 metre long, 60 metre wide, 195,000 ton Triple-E class vessel – equivalent in length to almost four football pitches – and capable of carrying more than 18,300 TEUs (Twenty-foot Equivalent Units) is one of the largest container vessels in the world, operating on Maersk’s new East-West Network. It was drawn alongside DP World London Gateway Port, adjacent to Europe’s largest logistics park, at 7.30am on Thursday 26th February, with the help of the Port of London Authority’s pilots. With quay cranes among the tallest in the world, coupled with cutting-edge, automated technology, DP World London Gateway enables vessels of this size and bigger to berth closer to two thirds of the UK market, removing unnecessary supply chain costs. The Munkebo Maersk’s call also comes just two weeks after DP World announced that it is moving forward with plans for a new 400 metre third berth at London Gateway, scheduled to be operational in the second half of 2016. Chief Executive of DP World London Gateway, Simon Moore, said: “This is yet another record and landmark moment for DP World London Gateway. “By welcoming the Munkebo Maersk we have demonstrated again that we are more than capable of handling the world’s biggest container ships, in this case operating on the Asia-Europe routes. “But ships are only going to get bigger and DP World London Gateway has been built to future proof its operational capacity, delivering efficiency that simply can’t be achieved elsewhere. Managing Director of Maersk Line UK and Ireland, Brian Godsafe, said: “We’re using DP World London Gateway to help ensure the right container equipment is available for our customers in the locations they want it. In this instance, that means out in the Far East where they can be used to transport goods across our East-West Network. A time lapse is currently being edited and will be available from www.youtube.com/user/londongateway in the afternoon of Thursday 26th February. For more images of the Munkebo’s arrival, click here to visit the London Gateway Flickr page. Opened Q4 2013, DP World London Gateway is the UK’s newest, major deep-sea container port adjacent to Europe’s largest logistics park. Owned and operated by DP World and situated on the north bank of the River Thames, London Gateway provides unrivalled deep-sea shipping access to the largest consumer markets in the UK. The port's location, with its superior operational systems and service, ensure ships load and unload as fast as possible, making London Gateway a world class asset for the UK.